'Mayfair: Summer farm, forty five signs for Micky Monsour' is made up of 45 found masonite panels that float, evenly spaced, across the wall. They take the form of vernacular road signs. 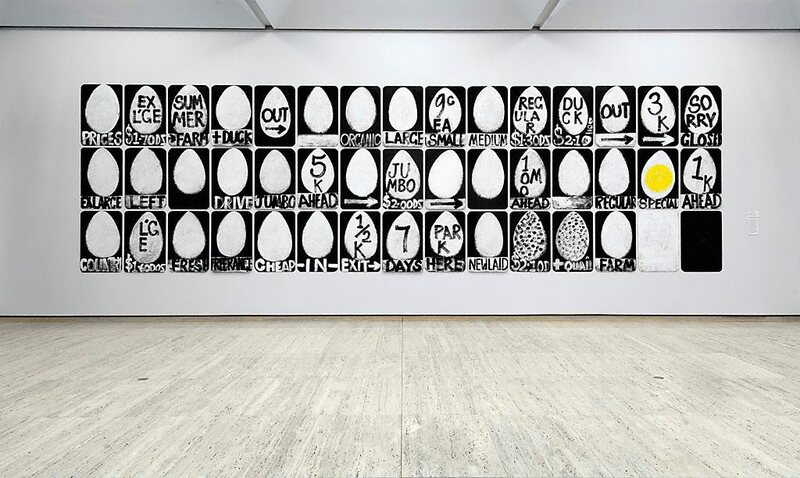 In this instance, the rather irreverent theme of the painting is the price of eggs. MacPherson began his road sign series in 1990. Other works in the series have focused on themes such as the Holden car, fruit and vegetables or fishing terms. Language has always held an important place in MacPherson's art. He explores the language of art and the art of language. There is an endless linguistic play in this work as the viewer creates his or her own sentences and humorous juxtapositions. It is as much about the accumulation of language as it is about the loss of colloquialisms, such as the old saying: "what has that got to do with the price of eggs?". This is language as 'found object' - heir to Duchamp. The 'Mayfair' in the title refers to the Mayfair bar were MacPherson used to buy lunch everyday. Common to all of MacPherson's work is an interest in the 'everyday': a delight in venerating the ordinary, as opposed to the New Zealand artist Colin McCahon who found the miraculous in the everyday. Suffusing this particular series is a tribute to rural Australia. Our imagination is sent down the Australian highway on a journey of colloquial and commercial exchange. There are chicken eggs, quail eggs, duck eggs, spotty eggs, a fried egg and white eggs in the shape of teardrops. 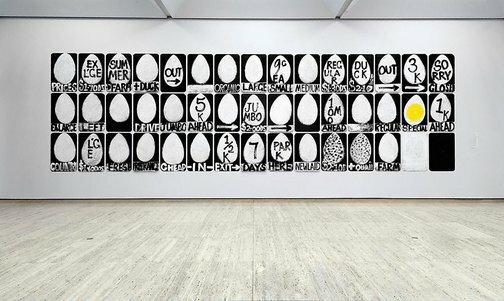 The term 'large eggs' gets compressed into L.E.G. There are eggs by the dozen and half dozen. This painting is both a nostalgic view of the quirky, idiosyncratic ways in which Australians used their rural terrain and a conceptual exploration of how we represent 'landscape', 'identity' and 'place' in the context of an Australian landscape tradition. Natasha Bullock, Contemporary: Art Gallery of New South Wales Contemporary Collection , 'Landscape, mapping, nature', pg.290-331, Sydney, 2006, 320, 322-3 (colour illus.). Felicity Fenner, The Sydney Morning Herald , 'A Fresh Angle on the Egg', p.20, Sydney, 22 Oct 1993, 20 (illus.). Felicity Fenner, The Sydney Morning Herald , 'Paying Homage to Holden', pg. 9, Sydney, 09 Sep 1994, 9. Elwyn Lynn, Australian , 'Signs of life - everyday variety', pg. 13, Sydney, 23 Oct 1993, 13 (illus.). John Saxby (Editor), Look , 'The art that made me: Nigel Milsom', pg. 12-13, Sydney, Jul 2016, 13 (colour illus.). Trevor Smith, Robert MacPherson , 'The world in my paintbrush', pg.49-79, Perth, 2001, 75, 133, 171 (colour illus. ), 172-173 (colour illus.). Wayne Tunnicliffe, Look , 'Write now: when images are not enough', pg.24-27, Sydney, May 2005, 25-6 (colour illus. ).